Group sets house the different groups within a course. Before creating a new group set, you may want to view the existing group sets. You can also clone an existing group set. Once you have created a group set, you can manually create groups in the set or automatically create groups in the set. Note: Canvas allows you to create up to 200 groups. Name the new group by typing it in the Group Set Name field . You can allow self sign-ups by selecting the Allow self sign-up checkbox . You can automatically split the groups in a number of equal groups by clicking the Split students into [number] groups radio button  and then typing the number of groups in the dialog box. You can manually create the groups by clicking on the I'll create groups manually radio button . 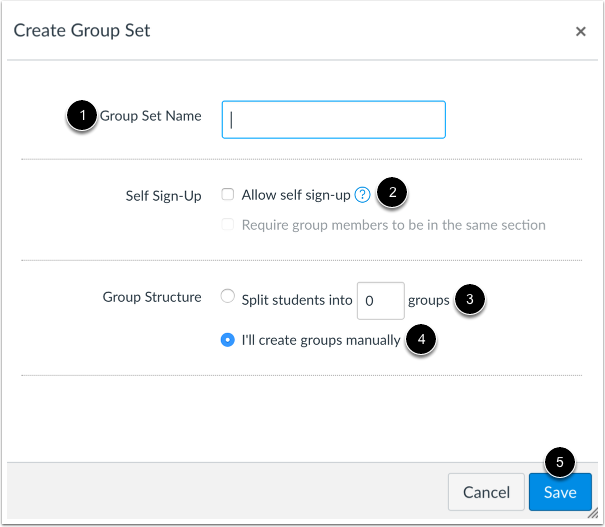 Except when creating groups manually, you can automatically set student group leaders. The Require group members to be in the same section option is available in self sign-up and automatically created groups. The maximum number of groups that Canvas can create for an automatically assigned group set is 200. 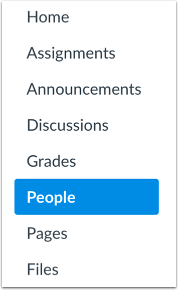 If you ask Canvas to create more than 200 groups, it will only create 200. View the group set you created. Previous Topic:How do I view all groups in a course as an instructor? Next Topic:How do I edit a group set in a course? Table of Contents > Groups > How do I add a group set in a course? Re: Is there a way to drop an assignment for all students into a shared folder?